Can VCRs and LCD TVs Work Together? Will an LCD TV Work With My Old VCR? If you are still using a VCR to record and play videotapes, you have probably noticed things have changed on TVs since you purchased that VCR. Fortunately, all LCD TVs (and that includes LED/LCD TVs -- whether 720p,1080p, or even 4K) made for consumer use will work with any existing video source device that provides standard composite or component video output, and for audio, standard analog RCA-style stereo outputs. This definitely includes all VCRs (BETA or VHS). However, it is important to note that an increasing number of LCD TVs are now combining composite and component video into a shared input connection, which means that you may not be able to connect both a composite and component video input source (with associated audio connection) into some TVs at the same time. Also, if you have an S-VHS VCR with S-Video connections. Some "older' LCD TVs may also accept S-video signals, but on an increasing number of newer sets, the S-video connection option has been eliminated. As time goes on, component, and perhaps even composite video connections may be discontinued. However, being able to connect your old VCR to LCD TV is one thing, the quality of what you see on the screen is another. Since VHS recordings are of such low resolution and have poor color consistency, they will definitely not look as good on a larger LCD screen TV as they would on a smaller 27-inch analog television. The image will look soft, color bleeding and video noise will be noticeable, and edges might look overly harsh. In addition, if the VHS source is especially poor (as a result of recordings made in the VHS EP mode, or camcorder footage originally shot in poor lighting conditions), the LCD TV might exhibit more motion lag artifacts than it would with high-quality video input sources. Another thing you will notice you play back old VHS videos on your LCD TV is that you may see black bars on the top and bottom of your screen. There is nothing wrong with your VCR or TV. What you are seeing is the result of the switchover from older analog TVs that have a 4x3 screen aspect ratio to HD and Ultra HD TVs that now have a 16x9 screen aspect ratio. For both video and audio via a wired connection, All LCD TVs now provide HDMI as their main input connection option (for both video and audio). This is to accommodate the increasing number of high definition sources (and now 4K sources). For example, most DVD player players have HDMI outputs, and all Blu-ray Disc players made since 2013 only offer HDMI as their video connection option. Most cable/satellite boxes also have HDMI output connections. 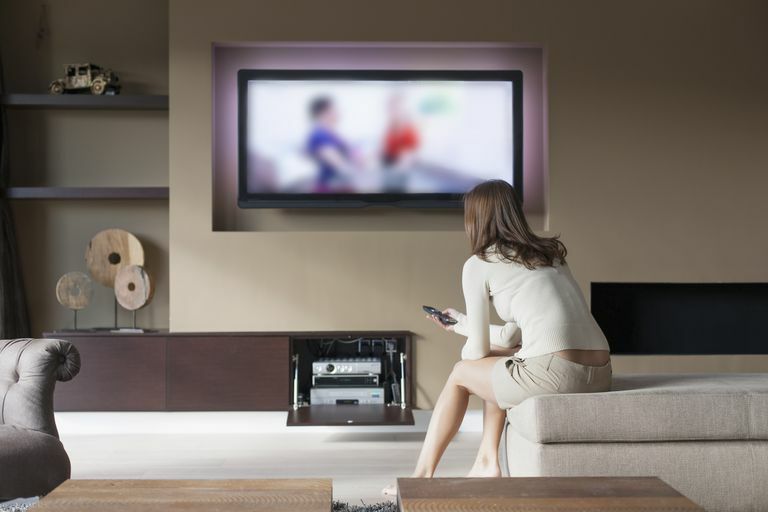 Most LCD TVs, due to their thin, flat panel design, usually provide some side-mounted connections, making the attachment your other components and cable or satellite TV box much easier. Although VCR production has been discontinued, there are still millions in use around the world, however, that number continues to dwindle. Fortunately, for the time being, if you buy a new LCD or 4K Ultra HD TV, you can still connect your VCR to it and playback those old VHS videos. However, time is running out -- at some point, all analog video connections may be removed as an option. That is already the case with S-video, and, in most cases, component and composite video connections on TVs are now shared. In other words, you may not be able to connect an older DVD player that does not have HDMI outputs, or a VCR, which only has composite video outputs to your LCD TV at the same time. Although being able to watch old VHS VCR recordings on your LCD TV may still be important, but if you are still actually recording TV shows or home videos onto VHS, the quality is very poor compared to other options. If nothing else, not only will your connection options become more rare with every new TV purchase, you will no longer be able to replace that old VCR with a new one.